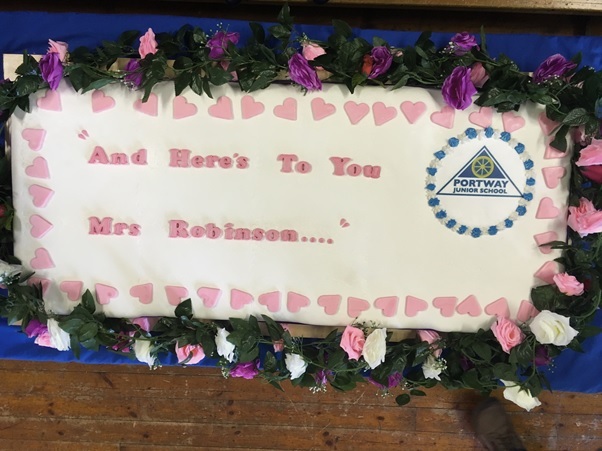 As you will be aware, our very own Mrs Robinson is retiring from Portway Junior School after 23 years as one of the first people you meet on reception. Her warm welcome to all visitors to the school is legendary and, if you have been fortunate to have met her, asked questions at reception, rung up or known that your children have been well looked after by her, then you will realise what a big gap she will leave. Of course, we couldn't let such a momentous event like this pass unrecognised and, as pupils at Portway are so good at keeping secrets, we had a few plans up our sleeves for assembly this morning! The cake was hidden behind the curtains on the stage and was revealed after we had got Mrs Robinson and Mr Smith up onto the stage on the pretext of saying goodbye to them both together. But then the ruse was revealed and Mr Smith left Mrs R to it! Click the link below to see a clip of assembly and the big reveal! That wasn't the only surprise though. Glee Club had been working hard at keeping secrets too and had planned and rehearsed a flash mob to their very own rendition of the famous Simon and Garfunkel song 'Mrs Robinson'. The link below will take you straight to their performance in the assembly. 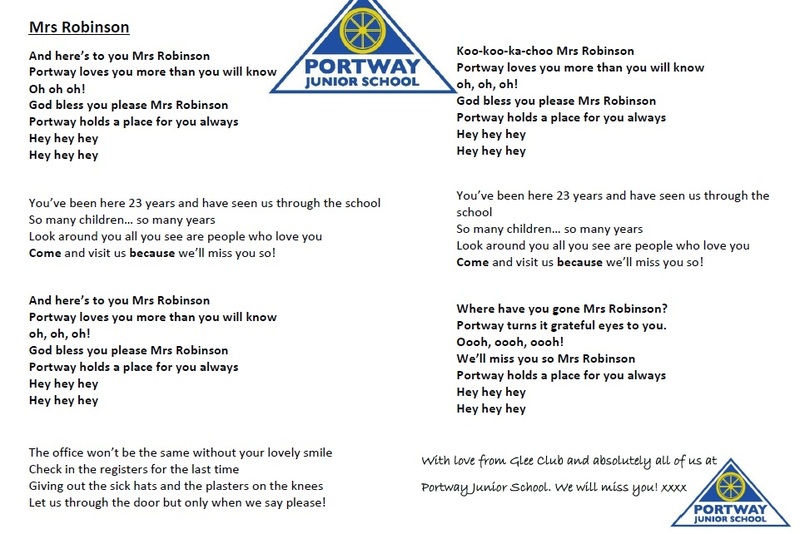 Afterwards, Mrs Robinson was presented with a framed copy of the words to the song and some special messages from each of the children at Portway Junior School, wishing her well in her retirement and thanking her for the good care she has taken of each of them over the years. After everyone had left the assembly hall, Glee Club stayed behind and sang again for another recording which can be viewed below. Of course it's not all over yet! There is still our final goodbye to have on Wednesday 20th July and all we know at the moment, is we might all need a tissue or two! Watch this space ...! "Here's to you Mrs Robinson! Portway loves you more than you will know!"